Grid Down: Power tools in a powerless world! Grid Down: Power tools in a powerless world! Power grid up or down, you need to be able to bore holes in wood, metal, plaster and concrete. You also need to be able to drive long screws and lag bolts, but most of all you need to be able to rip and crosscut studs, beams and plywood to size. Hand tools like those used in centuries past will likely reign supreme once again in a powerless world. Every prepper should have all of the necessary hand tools to take on any one of these tasks. But using them efficiently and effectively is a lot of hard work. Power tools usually make tasks like these a lot quicker and easier. The obvious challenge is keeping them powered when there is no power. But what if there was an efficient and effective way to keep your power tools running with enough juice even after the grid is gone? Portable gas generators are often thought of as the goto solution in the event of a power failure. A generator capable of powering a circular saw would not require very much storage space, but they are very noisy, expensive and require plenty of gas on hand to operate. However, Hurricane Sandy is a perfect example of cascading failures that left millions of people without basic utilities like power and water for weeks before they could be restored. Gas was sold out and store shelves were left bare. A solar generator powerful enough to power a circular saw would need to be rather large. Even powering a 120-volt refrigerator can be challenging. Obviously power can only be generated while the sun is out so power storage is the primary limiting factor, especially when it comes to smaller portable systems. Batteries take up a lot of space and they are very heavy. But power inversion is definitely a close second… The inversion process from 12-volt DC to 120-volt AC typically results in a substantial loss of power so it is best to stick with appliances that match your storage whenever possible. If the storage batteries are 12-volt, stick with 12-volt lights and appliances. As a plumbing contractor in a past life, and more recently as a network engineer, I’ve certainly had my share of cordless power tools. From the old 7.2-volt NiCad (nickel–cadmium) Makitas to the 18-volt Ni-MH (nickel–metal hydride) DeWALTs, and a bunch of others in between. Over the last five to ten years, cordless technology has advanced by leaps and bounds. Cordless power tools are nothing like those of the past. They are far superior, and most manufacturers have also moved to a new Li-ion (lithium-ion) power source which does not suffer from most of the limitations that the NiCad and Ni-MH batteries had. I was looking through Milwaukee’s product catalog one day at my local home improvement center and noticed that they had a huge assortment of 12-volt cordless tools available that share the same M12 power source. But it wasn’t until I noticed the Milwaukee 2510-20 M12 AC/DC Vehicle Charger when I came to the realization that M12 batteries could be charged with a high-level of efficiently from any common car battery, and without any significant loss of power during the charging process which is perfect for off-grid solar solutions. The vehicle charger can also be used to charge batteries from any 120-volt power source making it an extremely versatile option to consider. No need to keep more than one type of charger on hand, though a backup charger would be really nice to have nearby. Milwaukee also has an 18-volt line of cordless power tools that share their M18 power source. Like the M12 line, it also has a huge assortment of tools, each more powerful than their M12 counterparts, but they are also much larger and heavier as well. After years of lifting those heavy 18-volt DeWALT bar-bells, I finally decided to standardize on a smaller and lighter 12-volt power source shortly after watching a cordless demonstration of Milwaukee’s M12 product line. I knew they also had a larger and more powerful 18-volt M18 product line, but it was the small size, light weight and impressive power of the 12-volt system that really attracted me to it. Not to mention, the shorter charging cycles. 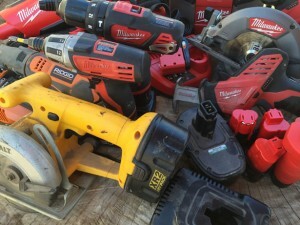 With all of the cordless power tools available as part of their M12 product line, I thought it might be nice to touch on a few of the tools that I have used and felt might be ideal for preppers to have on hand in the absence of the grid. 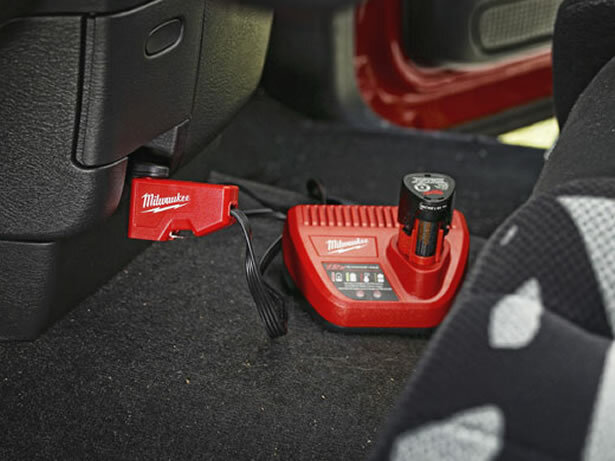 The Milwaukee 2510-20 M12 AC/DC Vehicle Charger is the same size and shape as the standard 120-volt model that comes included with most combination kits. The only noticeable difference is the power cord and adapter plug. It is big and red with a flip-out 12-volt DC power port adapter on one side and a flip-out 120-volt AC receptacle plug on the other. Each fold away to protect themselves when not in use. Charging one of the new Milwaukee 48-11-2420 M12 12V 2.0 Battery Packs nearly empty takes about 30 minutes to fully charge with one of the standard 120-volt chargers. Charging the same battery with the Milwaukee 2510-20 vehicle charger takes about 40 minutes when it is plugged into a 120-volt AC outlet, and it also takes about 40 minutes to fully charge the battery pack when it is plugged into the 12-volt power port in my truck. There are four variations of the extra-capacity battery packs so the charge time could vary a great deal. Additional batteries can be purchased separately from the small form factor Milwaukee 48-11-2420 M12 12V 2.0 Battery Pack to the larger Milwaukee 48-11-2440 M12 12V XC 4.0 Extended Capacity Battery Pack with a flat base that allows many of the tools to stand upright. you can also find older models which are all compatible, but they aren’t as high in capacity. As a result, they are much less expensive. Additionally, you can purchase third-party batteries with a varying degree of success. I’ve been using the Milwaukee 2408-20 M12 3/8 Hammer Drill Driver for quite a few years now and I have been very happy with it. The weight-to-power and balance of the tool are exceptional. Whether I am boring large holes in studs and steel brackets, or driving huge lag bolts, it has never let me down. It has even survived a number of tumbles off of a tall ladder without much more than a scratch or two. The power and quality of the 2411-22 have exceeded all of my expectations. It has an ergonomic design that reduces fatigue, especially when it is used over a long period of time. If you’d like to take a look at a thorough review of the 3/8″ 2411-22 that I did some years ago, Click Here. The Milwaukee 2407-20 M12 3/8 Drill Driver is Milwaukee’s updated model that it is also available as a complete kit with 2 batteries, a standard charger and a hard plastic case. The Milwaukee 2403-22 M12 Hammer Drill/Driver is the 1/2″ model that features a larger chuck and provides a little more torque. The 2403-22 is also available as a complete kit with 2 batteries, a standard charger and a hard plastic case. The Milwaukee 2401-20 M12 1/4″ Hex Screwdriver features a 0-500 rpm variable speed trigger and 15+1 adjustable clutch settings. It has been a workhorse from the moment that I first held it in my hand, and it is likely the cordless power tool that I use more than any other. Not only has it driven thousands of tiny machine screws while I’m building desktop machines and servers, I’ve also used it to assemble cabinets, hang drywall, and even building a patio cover driving 3″ deck screws and lag bolts as big as 1/2″ in diameter. The 2401-20 1/4″ driver is extremely powerful for its small size and has a very ergonomic design. But without the chuck and gearbox or electronic speed controls, it is much lighter than any of the hammer drills so it is much easier and less fatiguing to wield all day which is one of the primary reason why it has become my go to driver. Like the hammer drill, the 2401-20 driver has survived many falls that would render many inoperable and exceeded every expectation with flying colors. Milwaukee recently updated the 2401-20 nearly doubling the amount of torque it provides making it that much better. If I ever have to batten down the hatches, this is the driver that I would want in my tool bag. The 2401-20 is also available as a complete kit with 2 batteries, a standard charger and a hard plastic case, and there is also a two-speed model as well. I have been using reciprocating saws of one form or another for many years. They are typically very heavy and the power cords are usually a hassle to deal with, especially in tight areas like attics and crawlspaces, and I often found that them to be far more powerful than most jobs require. Sure once in a while you do need all that power, but most of the time they are overkill. The Milwaukee 2420-20 M12 Hackzall Saw features a lightweight ergonomic profile designed for single-handed operation with minimal fatigue. It has a keyless Quik-Lok blade clamp that allows for quick and easy blade changes and a 3/4″ reciprocating action providing plenty of power directly to the blade. Due to its small stature, it is able to fit into spaces that would be impossible for a full-size reciprocating saw. Even though the 2420-20 is much smaller and lighter than most other reciprocating saws, I have been able to cut beams as large as 12″ and steel brackets as thick as 1/4″ with ease. The secret is having the right blade for the job. Whether you are cutting material to keep people and the elements out, or you need to hack your way in to something, the Hackzall is a near-perfect addition to your tool kit. The Milwaukee 2420-20 M12 5-3/8″ Circular Saw is one of the newer additions to my tool crib so I haven’t really had the opportunity to put it through its paces like I have with the others. However, it has performed flawlessly on every task that I have thrown at it. So far I’ve been able to cut sheets of plywood and plastic panels to size, rip 2 x 4’s, and even trim dozens of 2 x 6 rafters and 2 x 10 fascia boards without any difficulty whatsoever. Some of the other tools that could be useful in a grid-down situation include the Milwaukee 2460-20 M12 Rotary Tool, Milwaukee 2426-20 M12 Cordless Multi-Tool, Milwaukee 2429-21XC M12 Sub-Compact Band Saw, Milwaukee 2416-20 M12 5/8-Inch SDS Plus Rotary Hammer, Milwaukee 2445-20 M12 Jig Saw, and even the Milwaukee 49-24-2310 M12 2.1A USB Power Source among so many others. All of which share the same power source. Most are available on Amazon and other retailers around the globe. This list is by no means complete, and there are many other brands available with varying levels of quality. Though, I am only aware of the availability of 12-volt and 18-volt vehicle chargers made by DeWALT, Ryobi and Milwaukee. If there are any others available, I would love to hear about them. I think it is pretty obvious that I am a fan of Milwaukee tools. However, I am also familiar with DeWALT, Rigid and Ryobi which are fine brands as well. My one and only complaint at the moment has got to be the lack of a 4″ angle grinder, trim router and orbital sander as part of Milwaukee’s M12 product line. Currently, the M18 angle grinder is the only cordless model available, and it seems that the DeWALT tool lineup is suffering from the same deficiency. I feel an angle grinder is another one of those power tools that I’d prefer to not have to do without. The real purpose of this article is to spark a discussion on the topic above. Please comment below… I would love to hear from anyone who would like to share some insight of their own.